I am a big fan of t shirts. I wear them 95% of the time. I love all kinds of tees, but my favorites are the funny or snarky ones. That's why I was thrilled to be given the opportunity to work with Crazy Dog T-Shirts and Nacho Mama Tees. If you like humor, they have the shirt for you. From Crazy Dog T-Shirts, I received this awesome Meat Is Murder tee. It is now Dan's favorite shirt. It has that wonderful feel of your much worn, super soft tee. Imagine that feel without the wear and tear your current tee has. 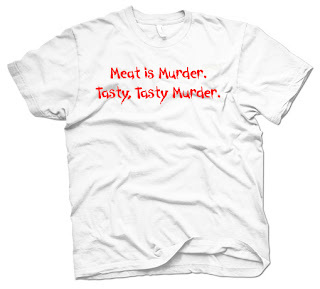 Dan now wears this shirt every time he is grilling up a juicy steak! From Nacho Mama Tees we got this cute ADHD tee for Tristen. He loves it and tried to wear it for several days in a row. It too is incredibly soft and comfy. It has quickly become his favorite t shirt. Both sites offer an incredible selection of tees. You can easily find the perfect gift for even the most difficult to buy for person on your list. 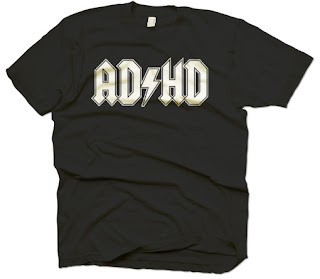 They have novelty tshirts, vintage tshirts, pretty much any tee you can think of. Now, I know at this point you are thinking that you just must have one of these great tees. You are in luck, as I have one tee from Crazy Dog T-Shirts and one from Nacho Mama Tees to giveaway to two lucky readers. All you have to do to enter is become a fan of Crazy Dog T-Shirts on Facebook or follow them on Twitter. This step is mandatory for entry. I'm already an FB fan of Crazy Dog T-shirts: Vicky Harris. I became a follow of them on Twitter:) Please enter me as I would love to win this!! Thanks!! I'm a facebook fan! Love those shirts, I have already done some Christmas shopping there. now Following CrazyDogTShirts on Twitter! now Following NachoMama on Twitter! Following CrazyDogShirts on twitter as ky2here1. I'm a FB fan, thanks! I follow CrazyDogTShirts on twitter! I follow on twitter - ohslowdown. and Im a fan on facebook.